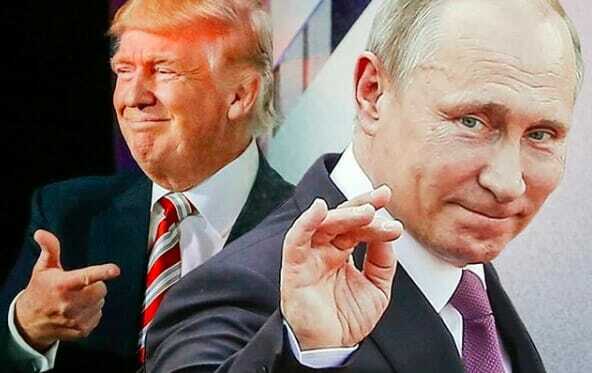 As the world watches the real-life farce of Donald Trump’s Helsinki summit backpedaling play out, it’s becoming impossible not to see a connection between the President and his Russian counterpart, Vladimir Putin. Even Fox News has boarded the train. Of course, to anyone who’s been paying attention the last year (and beyond), this is hardly new information. Visual artist Nancy Burson created the uber-creepy composite image. She said her goal for the project was to get people to “stop and think” about the similarities between the men. Read the accompanying cover story, by Brian Bennet, here. I think Trump probably loves that cover. He admires Putin and wants to be just like him. His cult followers probably love it as well. American democracy didn’t work for them during civil war times, and isn’t working for them now. They are ready for a dictator that will permanently preserve their way of life. That is their hope with Trump. Let’s be frank, the only people who read TIME are those trapped in a dentist office. They will soon be out of business like Newsweek. I suppose that is kind of like the “failing New York Times” your hero constantly (and hilariously) refers to? Trump’s imagination is as unlikely to change or create reality as yours is. Trump has shown over and over that he admires autocrats/dictators and wishes he had their power rather than being hampered by a nominally democratic system. And he showed quite plainly how self-absorbed and unfocused he is in his remarks to NATO and in Helsinki. Referring once again to his electoral collage victory, and making stuff up did not go over well on the world stage. he and his toadies are the only ones who claim (or actually believe it did). Regardless of the financial situation of Time, the cover is incisive and apt; your attempt to “be frank”, laughable. HOWEVER, the problem is…the Republican Party is dramatically shrinking. You see, when someone in the GOP decides they have had enough of Trump…they’re actually leaving the party. Currently only 26% of registered voters are Republicans (down 5% since Trump took over). So it doesn’t matter what the GOP thinks, what matters is how many are in the party. It is time to cut trying to be reasonable with this party. They would willingly let a foreign government have access to our election and even worse our President. Who doesn’t believe they have dirt on Trump. If they were able to get into the Vermont electrical grid that controls power plant just before the election do we really think they didn’t get into our ballot boxes? If your friends and family do not vote in November I seriously would cut them off as they are part of the problem!!!!! There is no evidence that they got into our ballot boxes, but there is apparently ample evidence that they tried. How odd then that the right just voted NOT to increase or maintain spending on election security, but instead to slough if off on the states. The very states most likely to be attacked are the very ones who lack the state funding to assure their elections remain fair and (surprise!) the very ones favoring an electoral college win over a popular vote win. The right hopes Russia will help make lightning strike twice for their beloved Trump. The cowardly Republicans in Congress are letting Trump play Russian roulette with our democracy. Vote the traitors out.